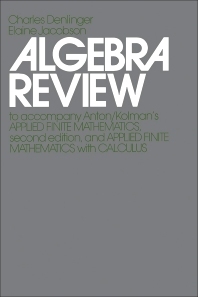 Algebra Review serves as a background supplement to Howard Anton and Bernard Kolman’s books on finite mathematics—Applied Finite Mathematics and Applied Finite Mathematics with Calculus. This book discusses the number systems of algebra, algebraic notation, exponents and radicals, and fractional exponents. The polynomials and factoring, binomial theorem, and rational expressions are also elaborated. This text covers equations such as linear equations, quadratic equations, and higher degree equations. The Cartesian coordinate system, graphing equations in two variables, and some special functions are likewise deliberated. This publication is a good source for mathematicians and students interested in finite mathematics and how to perform algebraic manipulations.